For quite some time now I couldn’t wait to send you off to a friend’s house to play. Maybe I’ll have a little more time to get things done. Maybe you won’t be so bored all the time. Maybe this summer we won’t want to scream at each other so much. In our current situation, one could only hope, right? We didn’t know anyone. Would they accept us? How do we make you some friends? Then today it happened. You came home and told me that the lady across the street wanted you to come play with her two daughters. Our new neighbors. This is what I’ve been waiting for! Finally. Except that after you walked toward their house, I felt lost. And I wondered. Is this how other parents felt when their child grew up and moved out of the house? Is it worse? IT CAN’T BE WORSE THAN THIS! I’m only slightly freaked out about it. Really. Yet. I also felt proud. The lady came over and asked if it was okay. She said to me, “Every day I look at her and think she’s sooooo cute. I want her to play with my children!” and my heart exploded. Into a million tiny pieces that I’m struggling to find. Someone wanted MY daughter to play with her kids! Our neighbors are new to this neighborhood. Even more than we are. So maybe they’re as lonely as we are and desperate for some friends. And I know how bad this may sound, but I’m happy. I probably would never have had the guts to go over there myself and try to make friends. I’m a little scared. And shy. Sounds insane, I know. But it’s true. I worry that someone will think I’m an awful mother. Or that you and your sister are not good enough for their kids. I’m afraid we’ll be rejected by the other families. So imagine my surprise that our neighbors wanted you to be friends with their kids just because YOU’RE CUTE! That’s it? No 20 questions? No interrogation whatsoever?! Really? Awesome! You said you had a good time and that you liked them. There was a tea party with cookies! They were so nice to you. I’m happy. We might make it through this summer after all. Will you be going there again tomorrow? Do you think you can bring your little sister with you? Just kidding. Kinda. This was the first time I was actually able to take Niki to Coulon Beach Park. When I said it was okay to go in the water, she completely lost it. Niki quotes from March to April 2009. I guess they had an assembly at school and someone was putting sparkles in the kids’ hair. She told them she not to put it in her hair. Apparently she’s a mind reader. She “knew” what her sister was thinking. In response to this! You HAVE TO click it! She’s been making chocolate milk for all of us. She puts a LOT of chocolate syrup, stirs it up and adds whipped cream on top. When her daddy said he loved it and it’s the best chocolate milk ever, that was her reply. *We started a twitter account for Niki to keep up to the minute updates of the funny things she says. We’ll be (attempting) to post digests every two months. This morning I watched you walk out the front door to head to your bus. Alone. The scared feeling I get every time you do that has gotten smaller with each passing day. I know now that you’ll be just fine without me attached to your schoolbag until you’ve stepped up that first step onto the bus. I know that when I hear the bus round the corner at just before 4PM every weekday, you’ll be walking through that door in just a few minutes. Each and every time you do, I feel relief. And pride. But do you remember at the beginning of the school year? That day when we both got scared and the only thing we wanted to do was cry? I remember that day so clearly. I don’t think I’ll ever be able to forget it. It was the first time I ever felt so terrified that I’d lost you and I didn’t know what to do. I waited at the bus stop until every last kid got off the bus. When you didn’t, I panicked. It was only the second day you’ve ridden the bus, so the bus driver had no idea who you or I was. I ran home and hopped in the car to look for you. Heart pounding and tears running down my face. I can only imagine how freaked out you were when you realized you got off at the wrong stop. You tried to find your way home, didn’t you? But when you thought all hope was lost, you sat on the curbside and cried. That was when the nice lady walking her dogs noticed you. She helped calm you down and gave you the confidence to find your way home. You did. I wish I had your confidence so I could look for her and thank her for helping you. Maybe even give her the biggest bear hug ever. Except I fear that she will tell me how awful I was for not waiting at home for you. What a terrible mother I was because I hadn’t thought to walk around the neighborhood with you to show you different ways to get home. I’d probably cry so hard in agreement that I wouldn’t be able to explain that I had gone looking for you. That the thought of you having to go through this never crossed my mind until it happened. That I’m sorry I’m so pathetic. I vowed from that day to do whatever it took to prevent this situation from happening again. But I couldn’t go about it the wrong way. I’m sure that other parents in my situation would choose to not let their kids out of their sight, but your mama? No. I was going to teach you what needed to be done if the situation arises again. Not that I want it to, but I’d much rather prepare you for these situations now instead of waiting until you’re “old enough”. I believe you’re old enough now. We started off slowly. We took a stroll around the neighborhood to familiarize ourselves. Now you know where the other bus stop is and how to get home from there. You carry an emergency contact card just incase you need to tell an adult. In the beginning I continued to walk you to and from the bus. I wanted to make sure you got off at the right stop from now on. When you and I were both confident enough for you to make your way home alone, I started waiting for you on the porch instead. Over time it got to the point where you’d walk to and from the bus while I watched from a distance. I wanted us both to feel like you could do it on your own. Eventually I started waiting inside for you when you got home. And now? Now you leave the house when you’re ready. It makes me beam with pride to know that you are becoming more and more independent. I can’t believe that you wake up on your own in the morning, get your cereal and milk (if you’re hungry), get yourself dressed, and feed the cats all with some time to spare. Then you look at me and say in a very confident voice, “I’m going now, mommy. I love you. Bye!” I just want to cry. Niki found this ladybug out back today. I had to take pictures of her holding it. This is probably the best one. I bought Niki a pair of chopsticks on Wednesday at Uwajimaya in Seattle. Both Ams and I tried to teach her how to use them, but failed miserably. Then today I look toward the table. She’s using them correctly while eating GRAPES with them! I asked her who taught her how to use them. She said in a very confident voice, “I learned on my own”. Ams & I took the girls to the community playground for the first time. It was a great way to start off the Spring season, especially since Niki is on break. Nine straight days of the never-ending energy that radiates from her. I needed to find an outlet for her to expel as much of it as possible so as not to drive me insane. For over an hour we chased the girls around with our cameras, as well as played with them on the swings and play area. Normally I couldn’t last that long, but I’m guessing all their energy and excitement rubbed off on me.. a little. I loved it. So did she. See the rest of the videos over here. Niki quotes from January to February 2009. Just after I kissed the hubs lightly before he left for work. *We recently started a twitter account for Niki to keep up to the minute updates of the funny things she says. We’ll be (attempting) to post digests for every two months. We had a dance party on a whim last night. This is Niki’s spontaneous dancing to a reggae band called 56 Hope. I’m considering having her choreograph a dance routine for a homemade music video. Niki: Mommy? What’s your daddy’s name? Niki: What is your mommy’s name? Niki: I know what Daddy’s mom & dad’s names. Me: Oh really? What are their names? For Thanksgiving we had to have some pumpkin cheesecake. Had to! It was so simple to make, I had Niki help me with the entire process. First we started with the crust. She broke them first and stuck them in the bag. Then she pounded and crushed them to itty bitty pieces. I melted the butter, poured in the sugar, and mixed it up. She spread it out (at least most of it). She couldn’t resist licking the sweet buttery spoon. I threw together the ingredients for the filling and started mixing. She helped by holding the bowl. She scooped the filling onto the crust and leveled it out. Baked and chilled. Daddy said it was the best one yet. 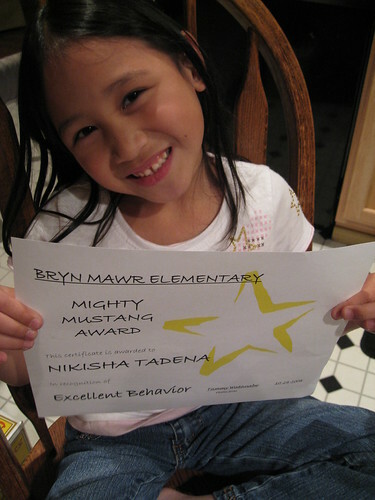 Yesterday Niki brought home this award and I was beaming with pride. 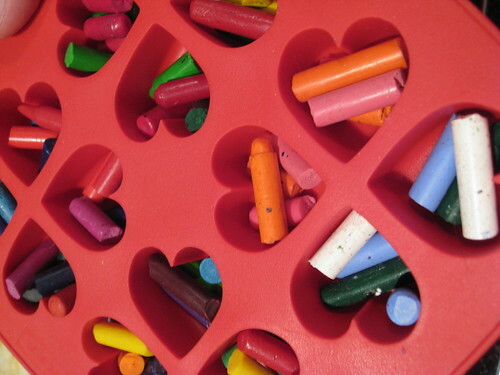 Niki has a ton of broken crayons and I recalled a project I found on the internet that I thought she would enjoy. Little did I know that I would love it as much as she does. When amsister saw what we had done, she insisted on us making more because she wanted to make them too. 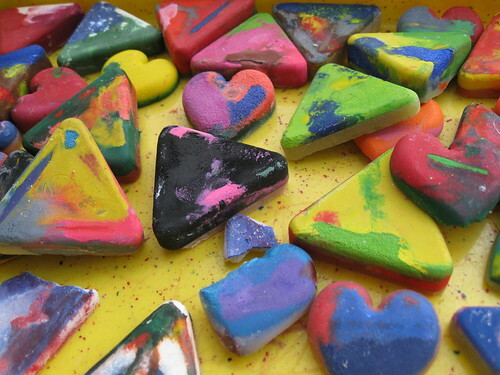 First we started out with the broken crayons and some shaped silicon ice cube trays. 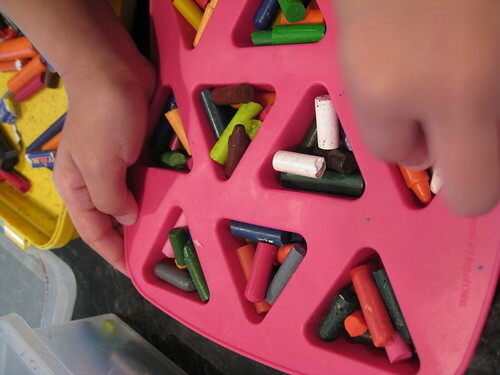 We broke the ones that wouldn’t fit and filled each one with different colors. She was so excited about the project even though she didn’t know what was about to happen. So she sat in front of the oven and watched. At one point she came over to me and said, “Mommy. I think I’m going to cry”. When I asked her why she said, “Because my crayons are melting!”. I had to assure her that it was okay and that they were supposed to do that. It took her a bit, but she calmed down and watched them go. 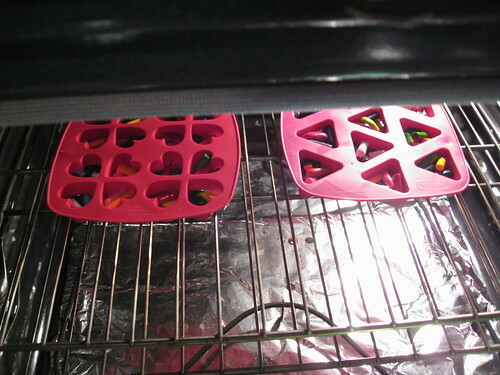 I took them out of the oven, let them cool, and popped them out of the trays. Imagine her surprise when she saw these. I’ve been wanting to do more with Niki and I knew that she would love helping me with cooking and baking. Friday we kicked off with something simple and made blueberry muffins. We cheated and got the boxed one where you just add oil and eggs. Niki helped me pour in all the ingredients and stirred it up. She put the cupcake cups in the tin and let me pour the batter in. We watched it rise and couldn’t wait for it to finish. We both enjoyed two each while they were still warm. 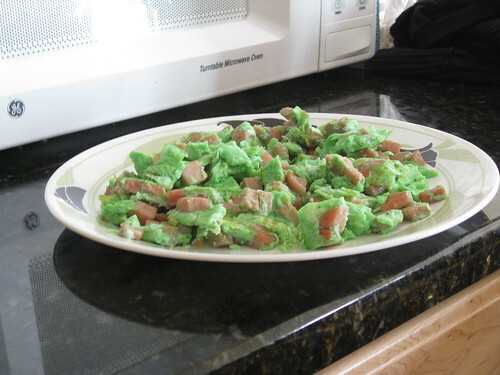 For breakfast today I asked Niki to help me make green eggs and Spam. We collected everything we needed and started the preparations. She took the eggs out of the carton, but she dropped one on the floor. She was a little sad, but the hubs and I assured her that everyone drops eggs eventually. Next she cracked the eggs and put them in the bowl. Three eggs and only one little piece of shell fell in the bowl. If you asked me, she did an awesome job for her first time. After fishing out the shell, I added a little salt and pepper, then pushed the bowl back over to Niki. 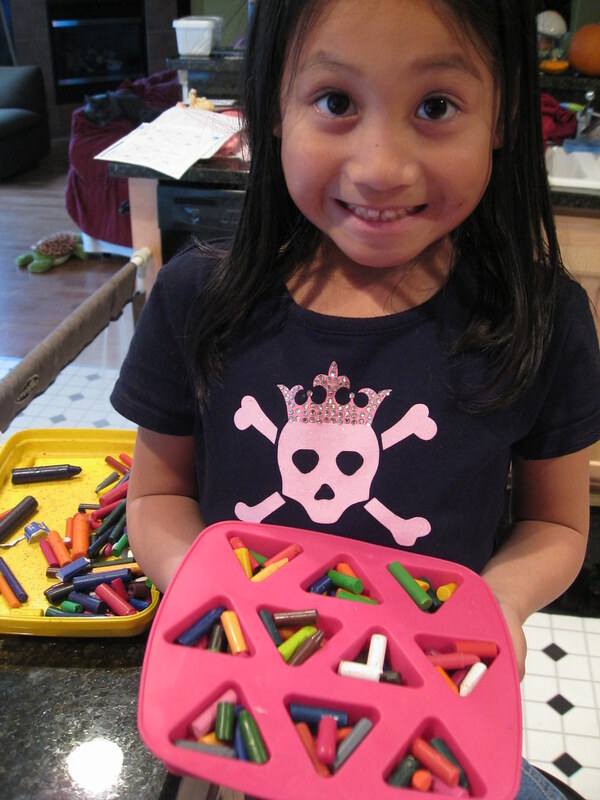 She added just one little drop of blue food coloring and whisked away. As she beat the eggs to a bloody green pulp, I chopped up some spam. Once we were both finished with our preparations, we were ready to start cooking. I set the pan on the stove and turned it on. Handed Niki the spoon and tossed in the spam. With a little of my help, she browned the spam nicely. Next she poured in the egg mixture. She then asked me to finish up the cooking. When it was all done and on the plate, she insisted on taking a bunch of pictures of it. The one posted up top was one of hers. It may look a bit gross to everyone, but trust me, it was good. Niki, Maeby and I ate it all up with nothing leftover. While laying down and watching The Neverending Story, Maeby starts crying because mom and dad are busy with other things around the house. Niki takes on the role of big sister and calls her sissy to lay down. I walk into the livingroom to find a happy Maeby curled into Niki’s arms. It could quite possibly be the cutest thing I’ve ever seen and all I could do was watch them and smile. Her name is Maria. She lives down the street. Last week Niki was so excited because she had a new friend. They were in the same class and rode the bus home together. Nik told me that they even fell asleep on the bus while leaning on each other. She was so happy about it all. I was happy because she made a friend. Than Monday she came home a little bummed. Maria made another friend and didn’t play with Nik. While trying to explain to her that it’s okay to have more than one friend, she cried. She “only wanted Maria!” and wouldn’t have it any other way. Yesterday she came home happy once again. Maria’s other friend drew a picture for Nik. It looked like they worked it out and were now all friends. What a relief it was to think that things will be okay in the friend world. At least for a while, right? Except it didn’t last at all. Today Maria told Niki that she didn’t want to be her friend anymore. I don’t know why and probably never will, but it breaks my heart seeing my daughter so sad. Niki’s 1st grade teachers stopped by the house today to drop off a folder, a workbook and a pencil for her. They introduced themselves as well as the rest of the 1st grade teachers. They all seem very sweet. It makes me excited and sad all at the same time. I can’t believe my girl will be starting 1st grade in a few days. My baby isn’t a baby anymore. She’s a first grader and a big sister. She’s sassy and silly. She’s crazy and beautiful. She’s smart and determined. She’s sweet and stubborn. She’s awesome. I can’t believe she’s already six.